In 2012 my path crossed with Hélène Blachet’s for the first time. Hélène was my cheerful and efficient assistant in a very full Kantha Workshop during Quilt Canada in Halifax. We have stayed in touch and exchanged emails off and on. I have been observing her success at the Grand National Quilt Show and was immensely surprised and pleased that she attended Art Quilt Campus 2014 in Muenster, SK. During one of the countless one-on-one consultations that week in July I came to fully realize Hélène’s high skill level and her strong focus on striving for excellence. When I approached her about a guest blogger spot she graciously accepted. I am pleased to introduce to you Hélène Blanchet, currently of Calgary, AB. I am a self-taught textile folk artist working with cloth to make fine art quilts and traditional hand-sewn textiles. I have been dabbling in fibre ever since I can remember only I didn’t know it was art. I made little pictures for myself in high school and for my kids later on. My first love has always been handwork – and colour, lots and lots of colour. I was fortunate enough to have been able to travel widely through my husband’s work while homeschooling our three children. This gave us access to wonderful libraries, museums and art galleries and, of course, regional textiles. So I studied and practiced and learned my craft. In 2007, we became empty-nesters and I turned my hand full time to the fibre arts. I had decided that I wanted to make a go of being a practicing artist full time. So I busied myself experimenting with a variety of materials, styles and techniques and began entering juried shows; locally, nationally and internationally, for which I won several ribbons. In 2009 we moved off-grid to a cabin in the woods in the Cape Breton Highlands to get our bearings and figure out what the next chapter in our post-children lives would be. During this time I continued to develop my quiet handwork surrounded by big nature, and joined local quilt guilds for the first time. The camaraderie of the women and the tranquility of the deep woods contributed greatly to my well-being and sense of self. With renewed confidence, I began to make a series of small landscapes depicting our immediate surroundings and my individual voice as an artist began to emerge. I had always thought of myself as a folk artist first and so I approached local folk art galleries to see if they would show my work. They did and continue to support my efforts. This is the type of work I did when we moved to our cabin in the woods. This is a picture of our neighbours Anne and Joel when they taught us how to cross-country ski. In 2011 we made a temporary move to Calgary to make our second fortune (having spent our first) which will allow us to return to Cape Breton and build our dream home and studio, and manage our acreage in the middle of the wilderness. The first thing I did when I arrived in Calgary was join the Fibre Arts Network (FAN), a group I had admired from afar for years. I entered my first show with them “From Away”. 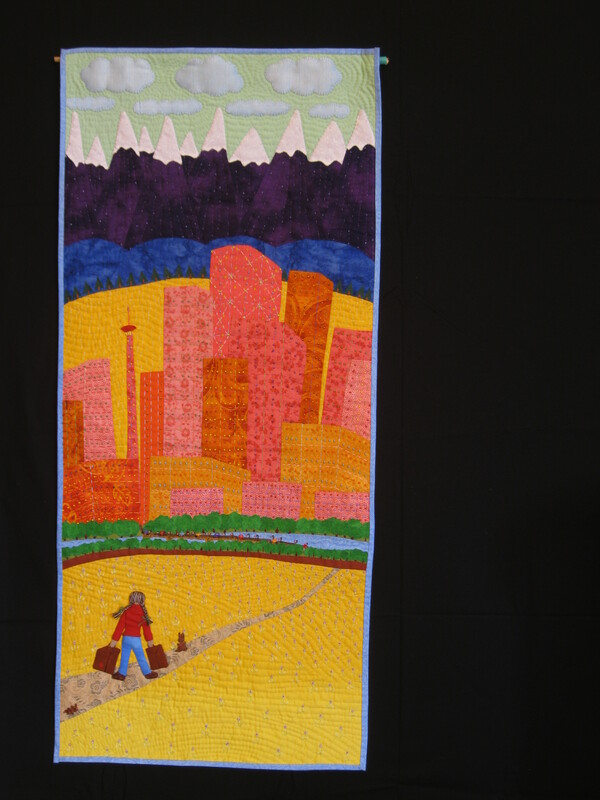 This inspired me to document our stay in Calgary through a series of quilts depicting our day-to-day. I draw my inspiration from everyday life and whatever strikes me as funny. Often it is the title of the piece that comes to me first, then the beginnings of the image materialize in my head. I write lists. Lots and lots of lists on scads of tiny bits of paper which I often lose. It doesn’t matter. The action of writing helps me retain the information. I’m not much of a sketcher or doodler. 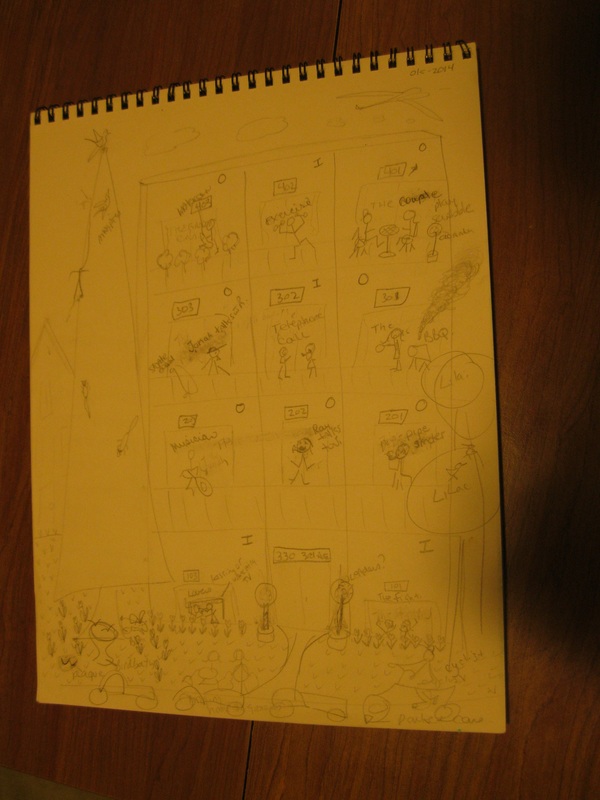 This photo is of a typical sketch. Just enough to give me an idea about composition. Once I’ve auditioned my fabrics and have the basic background made up I begin to fill in the detailed applique, quilting, embroidery and whatever else feels right at the time. I work by hand so the process is slow and the image evolves as I work. It might take me two months to finish an 18” x 36” piece. During that time of slow hand-work the story emerges in the details. 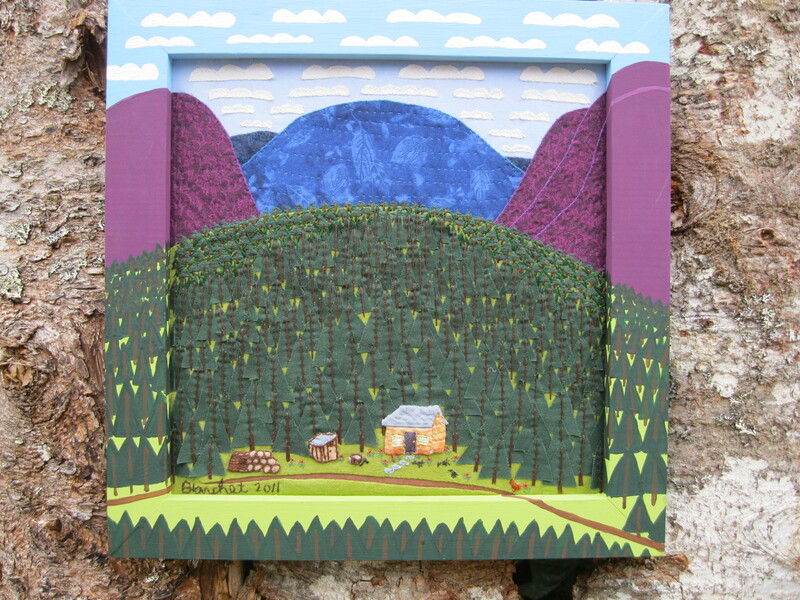 I think it is these details, this story-telling, that turns my work into folk art. Not just the bright colours and simple materials and techniques, but those too. This is where we live in Calgary. It’s a picture of us and our neighbours. We’re the couple in the top right hand. I hope you’ve enjoyed my first attempt at blogging. Thanks so much Anna, for this opportunity to share with your many followers. Thank you, Hélène! Your contribution is wonderful and I feel as if I am sitting next to you, listening to your story. I can’t wait to see more of your work in exhibitions and galleries! I hope everyone else has enjoyed Hélène’s story as much as I have. Please feel free to comment and weigh in with questions. Hélène will be checking the blog off and on to provide answers and responses. 29 Oct	This entry was published on October 29, 2014 at 12:49 pm. 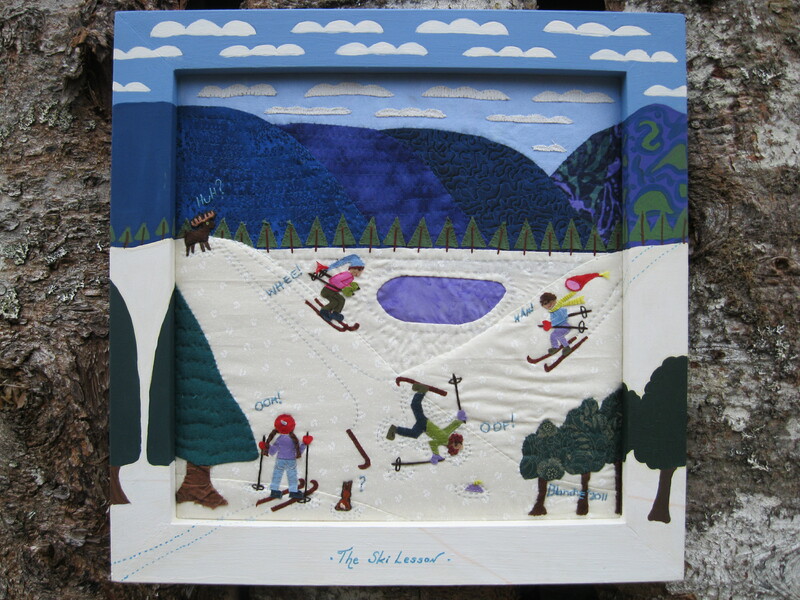 It’s filed under Art, Design, Guest Blogger, In the News, Journaling, Special event, Special Project and tagged applique artist Hélène Blanchet, Canadian fibre folk artist, guest blogger, guest blogger Hélène Blanchet, Hélène Blanchet. Bookmark the permalink. Follow any comments here with the RSS feed for this post. Thank you for sharing your creative story Helene. I too homeschooled my 2 daughters but am not quite an empty nester yet. Although I’ve returned to full-time employment I am enjoying having more creativity and stitching time. Your bright folk art quilts are fabulous and I especially like how each piece is inspired by your everyday life. Thank you so much Jeannette. I hope you’re able to indulge your creative self as much as possible even though life may not have slowed down much for you yet. Every little bit helps. Best of luck to you in your endeavours. 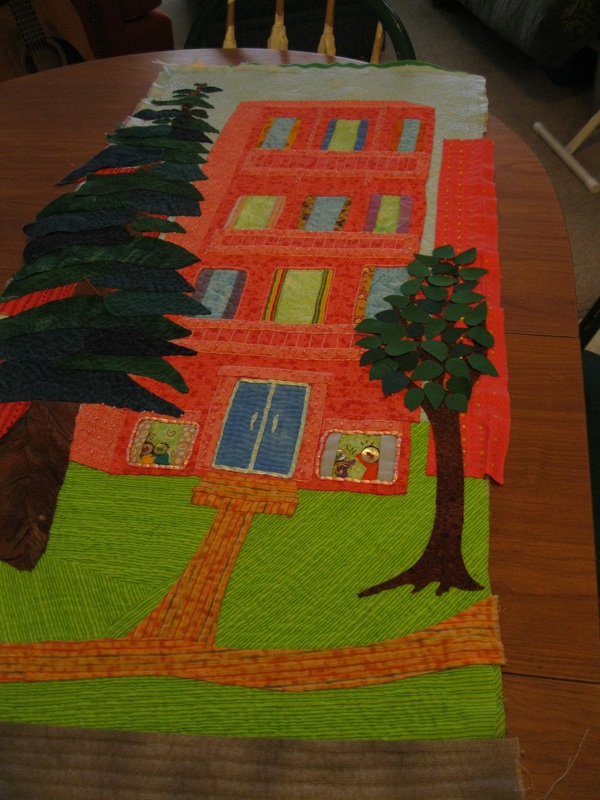 What delightful life/art synopses to accompany the photos of your charming art quilts Helene. Thank you very much for sharing yours stories and your art in response to Anna’s invitation, and thank you Anna for inviting Helene to be a guest blogger. I am inspired by the whimsical designs,vibrant colours, fibre choices, stitching and framing enhancements which all come together so beautifully in every single piece. It is easy to see why you have won such accolades for these truly winning compositions.Helene. Thanks so much, Judith. You’re very kind. Judith – Helene is a very talented and dedicated artist. I can’t wait to see what she creates once she has more time during the upcoming winter months! Very nicely done on both the blogging and your artwork! Thanks Anna and Helene for the blog post. I met Helene at the FAN retreat in the fall, but I remember seeing her work in Halifax previously. Hearing the background of the art work adds to the appreciation. There are many beautiful hideaways in western Canada Helene, no need to consider moving back east. Now, now Anna. They’re both very nice, but NS is home, that’s all. We hope to visit lots of those Western hideaways before we head East, J. Thanks Dorothy. Maybe we’ll see you at next year’s AQC? 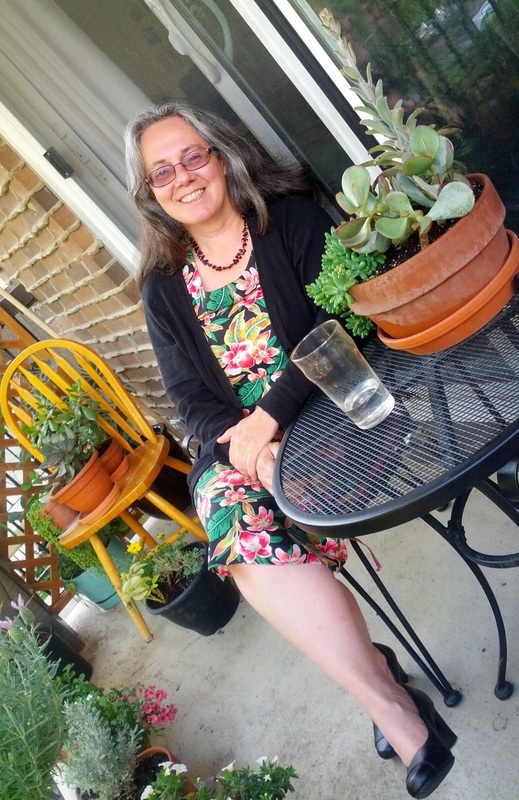 Helene – thank you for sharing your story and your work. To me it feels so uplifting and hopeful. I was particularly interested in hearing about your experience in beautiful Cape Breton. My husband and I have just purchased a property in the highlands with the intent of a slower and more creative lifestyle soon. I’m even more excited now! Anna – thanks for your great blog. It continues to be an unending source of wonderful information and inspiration. That’s wonderful Kristi! Where in the Highlands? There are a quite a few textile artists in the area that you’ll have to meet! Helene – we will be in the Middle River area near Baddeck. Are you near there? Yes, indeed! About 45 min away. We’re the northernmost property on the Margaree. Look forward to meeting you! It was wonderful to meet you at the FAN Retreat this fall in Edmonton. Your pieces are phenomenal, each one telling a detailed story of compassion and humour. Absolutely wonderful! I look forward to seeing more of your work. Great read Helene, thanks for sharing. I remember seeing your piece “from Away” at one of the exhibits. Sorry I missed you at AQC, as I was in the second week. Maybe we’ll meet next year then! thanks for sharing Helene! I hope you will take up blogging, you are a natural! I enjoyed hearing about the background of what is involved with the production of your work. I was fortunate enough to see your work live at the FAN retreat and enjoyed it so much. You make wonderful folk art. How nice of Anna to have you as a guest blogger. Helene, What lovely work! It’s delightful to look at and I appreciate seeing the work in progress along with the finished piece. I also loved the added painted frames on the earlier pieces. Thanks so much, Susan. you’re very kind. What an idyllic life and what lovely work! It is a very inspiring place indeed! Thank you. Hi. Helene, I loved meeting you and seeing your beautifully detailed and executed handwork in Muenster at Art Quilt Campus. Wonderful to read your blog and see some more of your art work and your process. Thank you so much for sharing. Now I am really inspired. Wow! – that’s great Marilyn! I really enjoyed getting to know you too (as you know) Hope to see you next year! Thank you Hélène – for your story and your art!